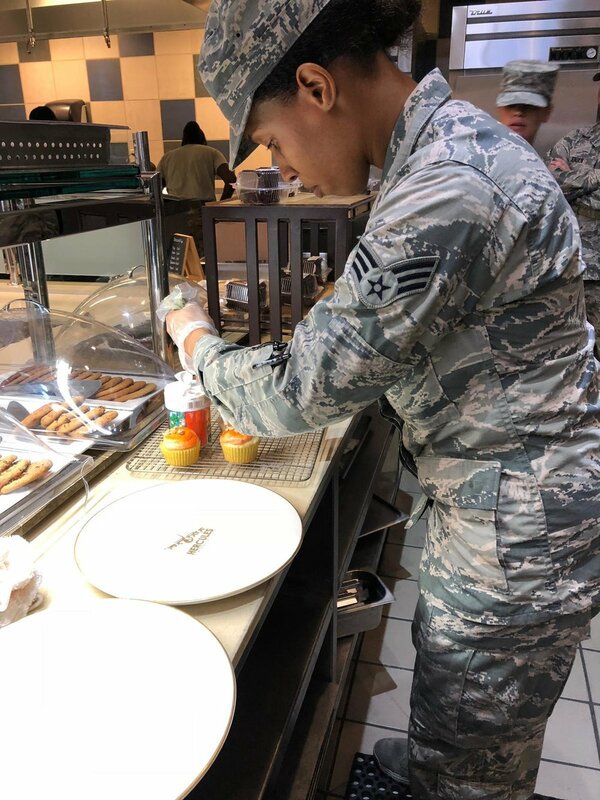 Our mission at Hercules Dining Facility is to provide quality, nutritious meals that enhance physical fitness, well-being, and the quality of life for LRAFB personnel. We pride ourselves on having a team in which all other food service organizations use to judge excellence in morale, facilities, customer service and satisfaction. Flight meals are available 24 hours a day. Order must be submitted by 2200 Monday - Friday and by 1600 on Saturday, Sunday, Holidays and Down Days. Click here to reserve the Chiefs Den and outside patio area at the DFAC! The Dining Facility of Little Rock AFB was recently announced as the 2017 USAF John L. Hennessy Trophy Award for the Eastern Region! The Hennessy Trophy is an annual award presented to Air Force installations with the best Food Service Program in the Air Force. Winners are selected based on their display and execution of excellence in Management Effectiveness, Force Readiness Support, Food Quality and Production, Employee and Customer Relations, Training, and Safety Awareness. We are dedicated to serving the best of the best at Little Rock AFB. Make sure to grab a bite at the best food service program in the AMC three years running! Essential Station Messing (ESM) holders can use their card at both the Hercules Dining Facility and Hungry Herk (P.O.D.) locations. These facilities are open to all DoD ID Card holders, family members, retirees, NAF civilians, and contractors. With a variety of choices and ways to eat healthier, the DFAC is here to make sure you’re ready for the mission. The Hercules Dining Facility features a rotating menu that offers seven different types of food. Big City Grill -- Choose from grilled and fried entrees, including hamburgers, turkey burgers, chicken sandwiches, chicken tender, fries (regular/potato) etc. Ciao Pizza -- Order a fresh, made-to-order 10-inch pizza made on flatbread! Create your own from a wide range of sauces, meat, toppings and cheese. Super Sonic Subs-- Choose between a 6- or 12-inch sub on fresh baked bread -- create a custom sandwich with meats, cheeses, toppings, spreads and seasonings. The Express -- No time to wait? Stop by the Grab-and-Go Express cooler for pre-made salads, sandwiches, parfaits, veggies and more! Greens, Grains + Soup -- Keep it healthy and simple with a wide selection of veggies from the salad bar. Soups are also available daily. Restaurant Rotation -- Change it up! This station changes quarterly. Menus include Asian cuisine, Indian favorites, BBQ specialties and more! Located right off of the flight line in Hangar 276, the Hungry Herk/POD offers fast and convenient grab-and-go options for the entire base. 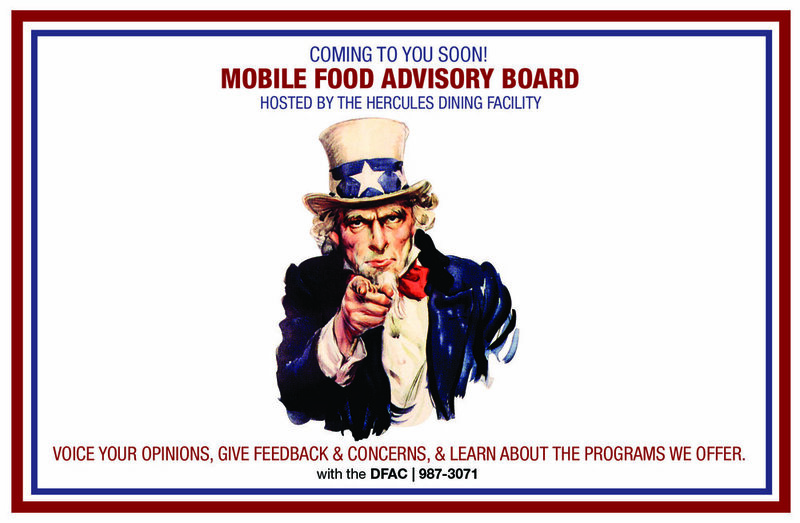 The Hercules Dining Facility supports all diets, to include vegetarian, religious, low-calories and more. To promote a healthy lifestyle and in an effort to improve healthy eating habits, the DFAC participates in the "Go for Green" Nutrition Education Program. This program uses a labeling system designed to prove a quick snapshot of the nutritional value of food choices in the facility. Food items are labeled in Green (Eat Often), Yellow (Eat Occasionally) and Red (Eat Rarely). The Healthy Herk Rock Plate easily identifies the healthiest meal offered during the meal period. Stop by and enjoy a meal with us! Join the Fitness Center’s Wingman Get Fit Challenge and win prizes! Weigh-ins and registration end on 18 January. Use our Go for Green program to create healthy, nutritious meals to keep you on track for success.